One science teacher from rural area for Kenya, wey dey give almost all of im salary to students wey poor, don win $1,000,000 cash prize for award of di best teacher in di world. 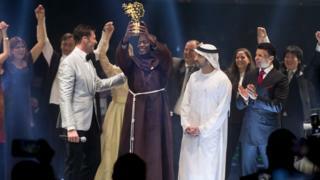 Peter Tabichi, wey bi member of one Catholic group wey dem dey call Fransica, win di 2019 Global Teacher Prize. Dem torchlight Brother Peter because of how im dey epp im students to learn well-well even though di class over-full and books no dey reach everibodi. "I wan craze wen I hear say I win BBC writing competition"
Di award, wey dem announce for ceremony wey happun for Dubai, recognise di ogbonge commitment of di teacher to im students dem. Im dey comot 80% of im salary to support student wey no get money for uniform or book for di Keriko Mixed Day Secondary School for Pwani Village, Nakuru. Di award na from competition wey Varkey Foundation organise, and Brother Peter beat 10,000 other nominations from 179 kontris. "Everitin no be about money," tok Brother Peter, wey get plenty student from poor family. Many of dem be orphan, wey don lose dia papa and/or mama. Di 36-year-old teacher, wen e win di prize, hail di young pipo for Africa. "As teacher wey dey work for front line I don see di promise of di young pipo [of Africa] - dia curiosity, talent, dia intelligence, dia belief. "Africa go produce scientists, engineers, entrepreneurs wey one day dia name go dey famous for every corner of di world. And girls go get big part for dis tori." Di prize winner dey try encourage families of girls not to remove dem from school because of early marriage. Kenya president, Uhuru Kenyatta don congratulate Brother Peter. "Peter - your tori na di tori of Africa, wey be young continent wit plenti talent," Na so di Kenya president tok. Video Petrol stations dey sell fuel complete?